Well, it’s really close to the first race of the season now, so it’s time to make sure the car’s ready to go. To be honest I feel very unprepared but we’ll see how the Silverstone test day goes. As you’ll know the only test I’ve done this year was the trackday at Rockingham (see the photo above courtesy of Charlie). I really should have put more time into it but haven’t managed to find the time. All the same, I need to get the car ready. 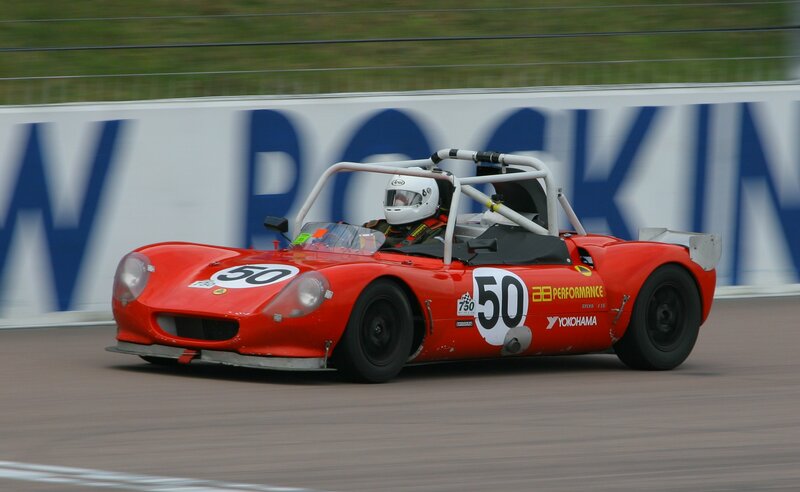 One issue is that I only squeaked through the noise test at Rockingham. So, I took off the silencer can to find, as expected, that a good deal of the wadding had disappeared. As you can see from the photo a good bit of it was left, but most of that had become glass-like and was therefore doubtless a waste of space. 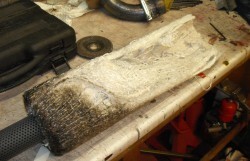 So, I repacked with nice new wadding and wrapped the expansion tube with stainless wire wool. Once it was back together it was clear that it was making rather less noise, even when idling. Hopefully it’ll be a good deal different at the circuit. I’ve also adjusted the gearing, it was really too tall at Rockingham. Odd because I’d set it to that position at the Birkett last year when I was running out of revs in 6th down the Hangar straight. You’d have thought that Rockingham would have been as quick, but I was being circumspect because of the noise and short shifting along the banking. I finished off the exhaust system by welding the cat to the end of the tail pipe. Although it was working with a big exhaust clamp on it the weight rather annoyed me. Mind you, there’s an issue with this in that I’m concerned that bits of wadding might end up blocking the cat. If so, I’ll have to come up with another solution. For now, though, it’s a great plan.